I am thankful for so many things, most of which don’t really relate to this blog. But one thing I can write about here is that I’m thankful that nowadays, tasty wines are being made all over the place. Americans have become much savvier wine consumers, demanding higher quality, and entrepreneurs have set up wineries in all 50 states. Ever more countries have discovered what unique combination of terroirs and grape varieties work for them. I am thankful that in all of known history, there has never been a time when so much fine wine from so many different places has been available at such affordable prices. One winery I’m thankful for is Von Stiehl, in the lakeside town of Algoma, Wisconsin, where I had a memorable tour and tasting led by a former cast member of Hee-Haw. 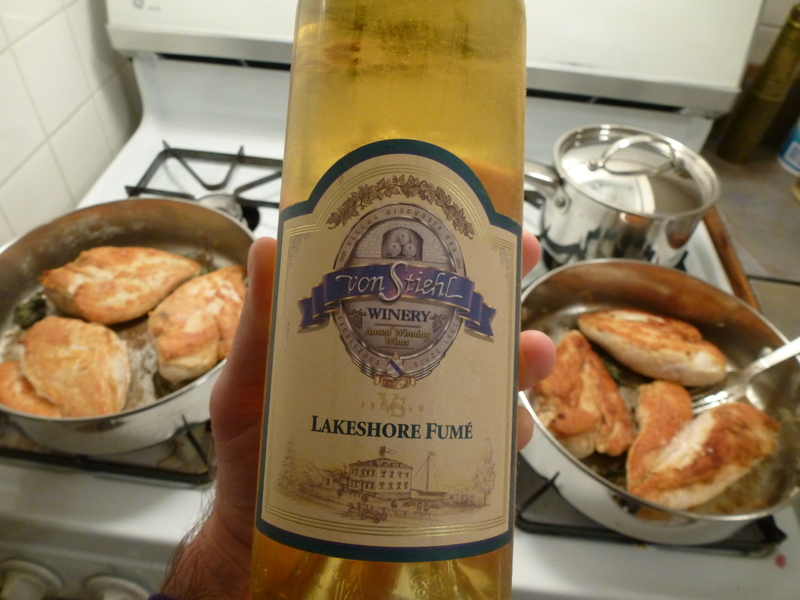 I wrote about Von Stiehl’s well-made Cabernet Sauvignon in this post a little while back, but I also brought home another bottle from that visit: A non-vintage Von Stiehl Lakeshore Fumé. This wine is not actually a “Fumé Blanc,” a somewhat indeterminate style of Sauvignon Blanc invented in the 1970s by Robert Mondavi involving some oak aging. Von Stiehl made this wine with Seyval Blanc, a French hybrid which is “productive, ripens early and is well suited to relatively cool climates,” according to The Oxford Companion to Wine. It sounds ideal for a Wisconsin winery. But because it has some non-vinifera relations, you’re unlikely to find any wines labeled as Seyval Blanc in its home country. Europeans always have been rather intolerant of those lacking respectable lineage. In any case, I liked this Seyval Blanc enough to buy a bottle and cart it home. Unfortunately, it then remained on my wine rack for years, essentially unprotected from Chicago’s hot summers. I decided it was high time to open this half-forgotten bottle, because it would surely gain nothing from aging any further. So while making a batch of chicken saltimbocca with roasted Brussels sprouts, carrots and sunchokes, I cracked it open and hoped for the best. The wine had deepened in color, turning a rich gold, and it had some pineapple in the aroma. I was relieved to smell fruit instead of mildew, dung, or nothing at all. It actually reminded me of a light Sauterne, with some woodsiness and tropical fruit, but it was but a shade of this noble French wine at this point. The fruit felt a bit flabby. Some acids remained, especially in the first 15 minutes after the wine was opened, but they started to dissapate thereafter. The wine became too white-grapey, and flab replaced what was once surely some lively fruit. I enjoyed the first intriguing glass, but the rest of the bottle just didn’t make it. I had waited too long, and once again, a fine bottle of wine died a slow, silent death on my wine rack. Maybe it’s time to be thankful for the wines I already have in my collection, and open the rest of the older wines now, before they too suffer a similar fate. NV Von Stiehl Lakeshore Fumé: Originally surely well-balanced with lively acids, tropical fruit and a touch of wood, this wine didn’t age all that well. The acids decayed, and the wine became flabby. A fine choice, but drink it soon after purchase. Grade: I can’t really give this wine a fair assessment. Find It: Von Stiehl now sells this wine under its “Up North” label as “Tranquility Lookout,” priced at about $13.